NEW DELHI: Voting process for the 51th Lok Sabha (Lower house of the Parliament) in India started on Thursday. More than 142 million Indians are eligible to vote in the first phase, of a total of 898.9 million. Votes in the seven rounds, spread over 39 days, will be counted on May 23. Narindera Modi is seen as the front-runner, campaigning on his national security record. Voting in the first of seven rounds will be held in 91 constituencies across 20 states and federally-administered regions. It is worth to mention that Kashmir issue and relations with Pakistan are among important agenda of election manifesto of both parties. 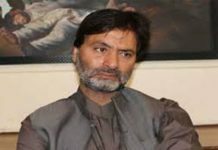 BJP has vowed to strip decades-old special rights from the people of occupied Kashmir, making an election promise. Pollsters say its re-election campaign got a boost from recent hostilities with Pakistan, after Jaish-e-Mohammad (JeM) reportedly claimed a February suicide bombing in Pulwama that killed 40 Indian security forces. 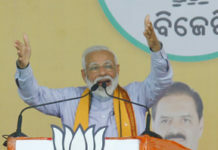 “Nationalism is our inspiration,” Modi said after releasing the BJP’s election manifesto at its headquarters in New Delhi, as supporters chanted “Modi, Modi”. The BJP has consistently advocated an end to Jammu & Kashmir’s special constitutional status, which prevents outsiders from buying property there, arguing that such laws have hindered its ‘integration’ with the rest of India. “We believe that Article 35A is an obstacle in the development of the state,” the party said, referring to a constitutional provision dating from 1954, and reiterated its long-held desire to abolish J&K’s autonomous status by scrapping another law known as Article 370. BJP supporters have demanded the removal, expressing anger at many Kashmiris’ resistance to rule by India. Kashmiris have been fighting Indian control of the region since 1989. Most Kashmiris support the demand that the territory be united either under Pakistani rule or as an independent country, while also participating in civilian street protests against Indian rule. “The BJP’s campaign is largely around nationalism, national security and this is what is getting echoed in their manifesto,” said Sanjay Kumar, director of thinktank the Centre for the Study of Developing Societies. 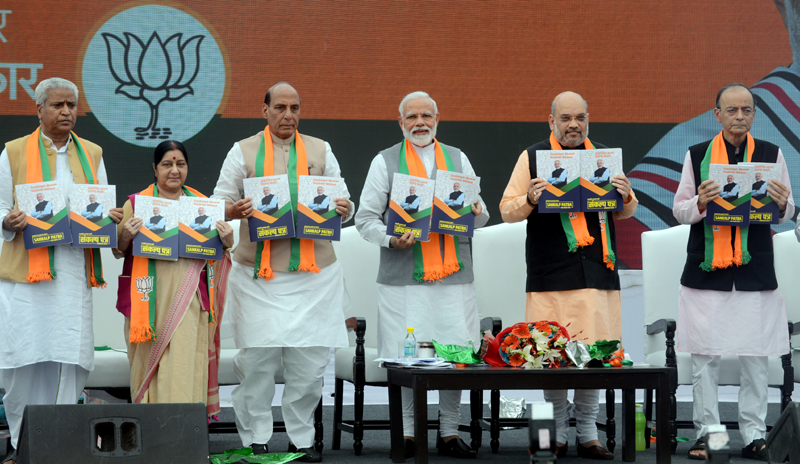 BJP’s manifesto described as “sankalp patra” or document of promises has been weaved on the theme of a “Sankalpit Bharat – Shashakt Bharat” or “determined India, empowered India”. Prime Minister Narendra Modi on Sunday took a jibe at Congress for its manifesto, alleging that it seems to be blowing Pakistan’s trumpet more than that of India. “For the first time, India carried out attacks across the border against the terrorist hotbeds. But Congress is asking for proof. People trust the armed forces but not Congress leaders. Congress is taking forward the propaganda which Pakistan want to spread across the world,” he said at a rally here. “Congress’ fraud document seems to be blowing the trumpet for Pakistan more than that of India. Congress has said that nobody can touch Article 370 (special status for Jammu and Kashmir) of the Constitution. The government in Pakistan has also been taking the same stand. What is the connection?” Modi asked. 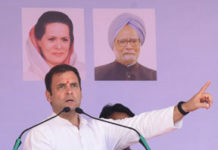 A day after the Bharatiya Janata Party released its ‘Sankalp Patra’ or manifesto for the forthcoming Lok Sabha elections, Congress president Rahul Gandhi criticised the same, calling it the “voice of an isolated man”. He also termed the manifesto “short-sighted and arrogant”. “The Congress manifesto was created through discussion. The voice of over a million Indian people, it is wise and powerful. The BJP manifesto was created in a closed room. The voice of an isolated man, it is short-sighted and arrogant,” Gandhi tweeted on Tuesday.